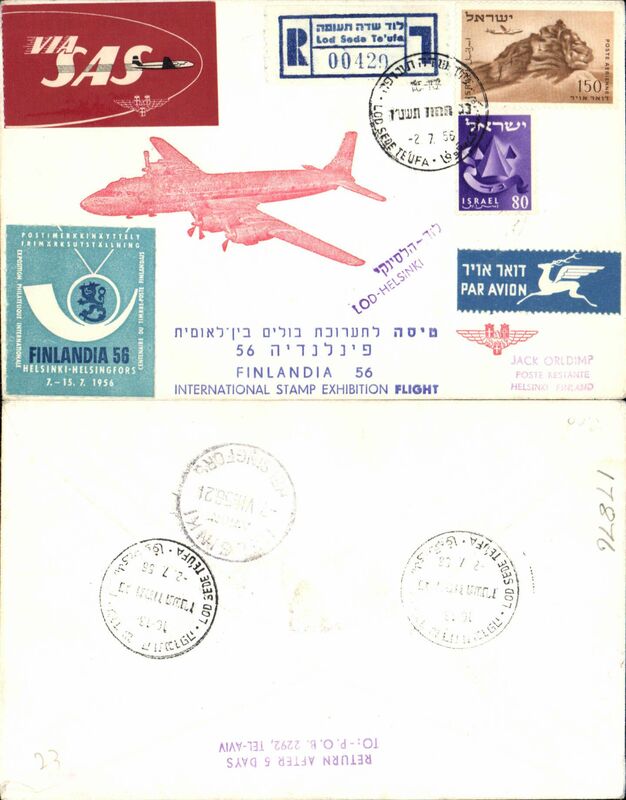 Israel acceptance for SAS first Transpolar flight, Lod to Los Angeles, b/s, flown to Copenhagen, the OAT to LA, registered souvenir cover, cachet, red/white/blue company etiquette and three different and attractive vignettes. SAS Finlandia Philex Flight Lod to Helsinki, bs 7/7, registered (label) Expo souvenir. 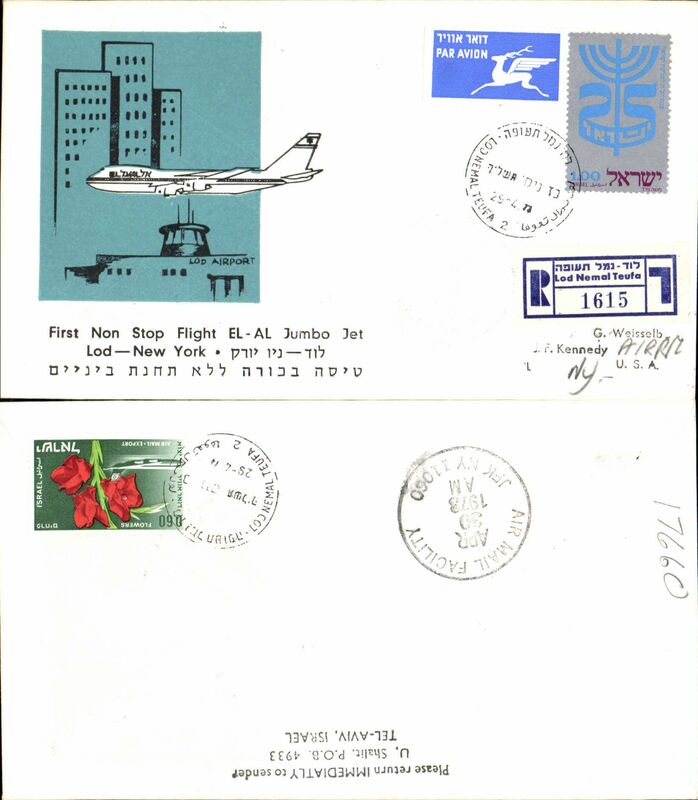 El Al Airlines, F/F Lod to Sharmel Sheik, souvenir cover, flight cachet, b/s. SAS first regular flight Stockholm-Tokyo via the North Pole, bs 26/2, printed registere (label) souvenir cover, franked 500 air, red and blue flight cachets. 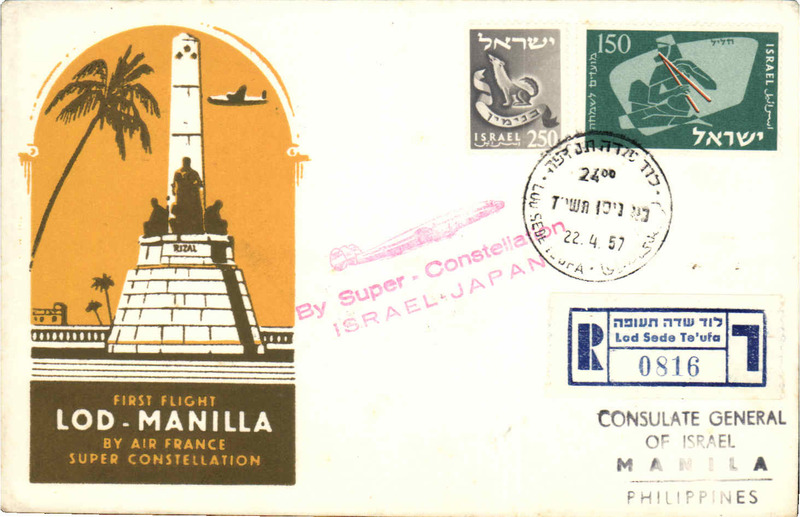 ELAL special flight, Tel Aviv-New York, b/s, depart canc, reg (label) souvenir cover. BEA Comet 4B F/F Lod-Rome, b/s, printed souvenir cover. BEA Comet 4B F/F Lod-Birmingham, b/s, printed souvenir cover. 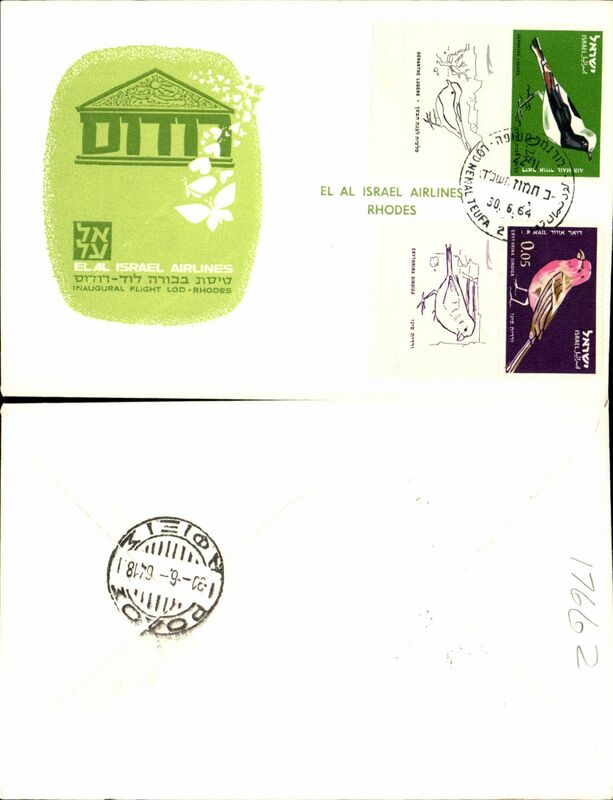 El Al Israel Airlines F/F Lod to Rhodes, bs, green/cream souvenir cover franked 0.05 & ).28 bird stamps with tabs. BEA Comet 4b F/F Lod-Rome, bs, printed souvenir cover. BEA Comet 4b F/F Lod-Birmingham, arrival ds on front printed souvenir cover. 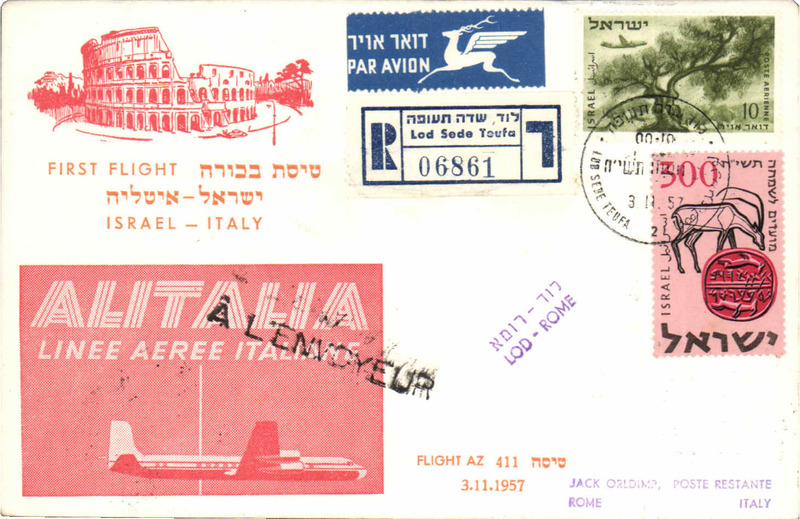 DLH, F/F Tel Aviv-Frankfurt, depart cachet, b/s, souvenir cover. 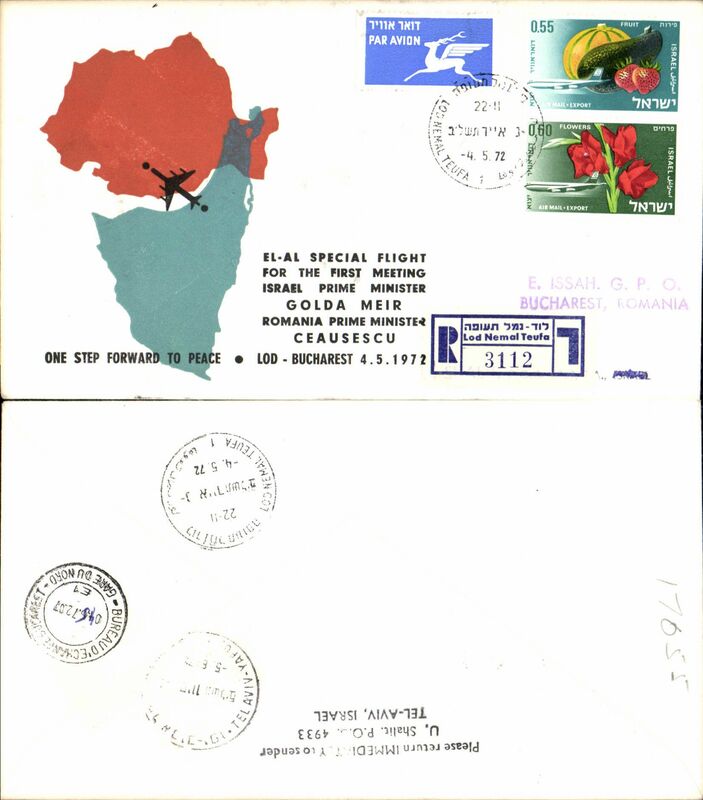 El Al Israel Airlines special flight, Lod to Bucharest, b/s, for the first meeting of the Israeli and Rumanian prime ministers, registered blue/orange/cream souvenir cover. 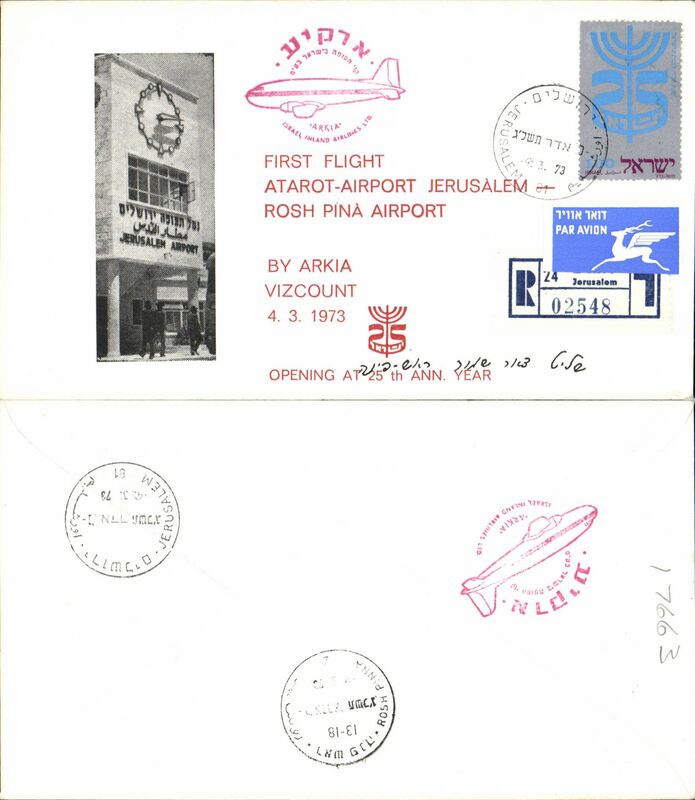 Arka, F/F Viscount, Atarot, Jerusalem -Rosh Pina, b/s, registered black/red/cream souvenir cover, flight cachet. 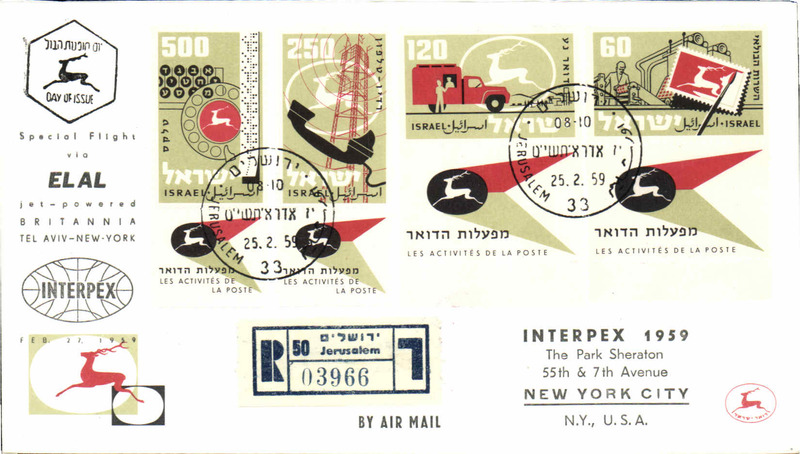 El Al Israel Airlines F/F Lod to New York, b/s, registered black/green/cream souvenir cover. Aab Republic of Egypt AL, F/F Jerusalem-Cairo, arrival ds on front and back, red/black/blue/cream souvenir cover, fight cachet. 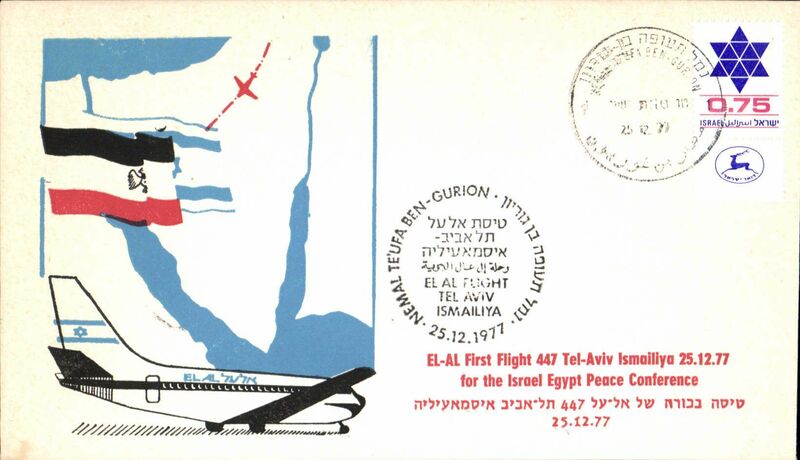 El Al Israel Airlines , F/F 447 Tel Aviv-Ismailia, red/black/blue/cream souvenir cover, fight cachet.